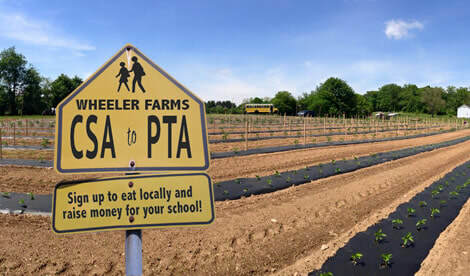 The Wheeler Farm has been partnering up with PTA and PTO organizations in our surrounding counties for 3 years. Out of our passion for education and fresh local food in our community, we have designed a donation program that has been highly successful. Raise money for your school programs while enjoying the freshest, local produce. When you join the CSA, money will be returned to your schools' PTA as a donation. ($25 per half share and $50 per full share) Some organizations are using this program to increase their budget and others are using the profits as a means to give back. Either way, we believe this partnership will help grow your PTA visions as well as our health initiatives. Contact us to have your school added to the list. 8-10 different vegetable and fruit selections each week (Half shares are also available). Add farm fresh eggs, local meat, farm fresh cheeses, local breads, farm made pickles, cider and jams to your order any week. Do I pick up my CSA share or is it delivered?